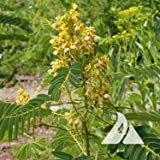 Senna italica growing shrub of the genus Senna also known as Port Royal senna, Senna italica perennial deciduous plant, used as ornamental hedge plant and attract pollinator, can grow in desert, mediterranean, subtropical or tropic climate and growing in hardiness zone 9+. Leaves color green in elliptic shape the leaves grow in pinnate structure. Flower color yellow, when the flowers close in round shape when open in bowl shape, flowers grow on stems in clusters. Yellow flowers when the flowers close in round shape when open in bowl shape, flowers grow on stems in clusters.